All gifts to Palmer Trinity School are tax deductible as charitable contributions. Palmer Trinity is a not-for-profit organization and is exempt from federal tax under section 501(c) (3) of the IRS Code. My family is already paying tuition, and plenty of it. How does my child benefit when we donate to the Annual Fund as well? 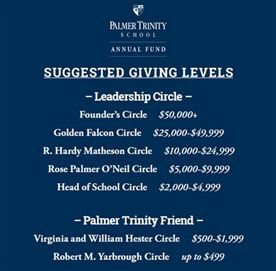 As an independent private school, charitable gifts are a crucial part of Palmer Trinity's healthy financial operation. Your donation to the Annual Fund supports what matters to you at PTS: talented teachers, small classes, enriching arts and athletics, library and teaching resources, technology, safety, and much more. A pledge is a "promise" to give a certain amount prior to the fiscal year end (June 30). Pledging is a great way to confirm your commitment to the Annual Fund, but fulfill the gift at a time that fits better with your families philanthropic plans. Many families also use pledges to increase the impact of their gift by organizing pledges to be fulfilled in multiple installments. To organize an Annual Fund pledge, contact George Montes at gmontes@palmertrinity.org. We ask each family to consider giving at a level that is personally significant to them. 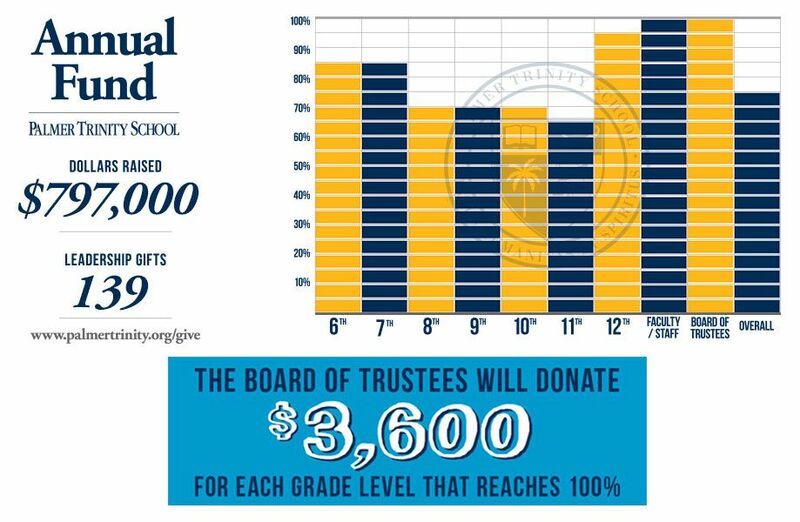 Our giving levels are featured below, and our hope is that each family will join a Leadership Circle level that best exemplifies their capacity to give. To maximize the annual influence of our community's generosity, we ask that you consider making your gift during our Fall Annual Fund drive. Although the fiscal year ends June 30th, an early commitment to the Annual Fund puts PTS in a great position to allocate resources for our children. It also puts PTS in a great position to market our amazing internal support to other constituencies considering supporting the PTS mission. Are gifts to the Annual Fund tax deductible? What is a matching gift? Yes, gifts to the Annual Fund are tax deductible. As an employee benefit, more than 550 American corporations match their staffs' philanthropic contributions. If your employer has a gift-matching program, you can double or triple your support to PTS!